Feb 1 Ralph Northam: Klansman or Blackface? Nothing like a yearbook photo of a man in blackface yukking it up with someone in Klan robes to kick off Black History Month. For about four long hours on Friday afternoon there were crickets from Virginia’s Governor’s Mansion where Ralph Northam and his advisors were no doubt trying to figure out how to spin the unspinnable. How did that picture get on his medical school yearbook page? Finally, the governor admitted that was him in the photo. Doesn’t represent his values, of course. Will take time to heal. Blah, blah, blah. 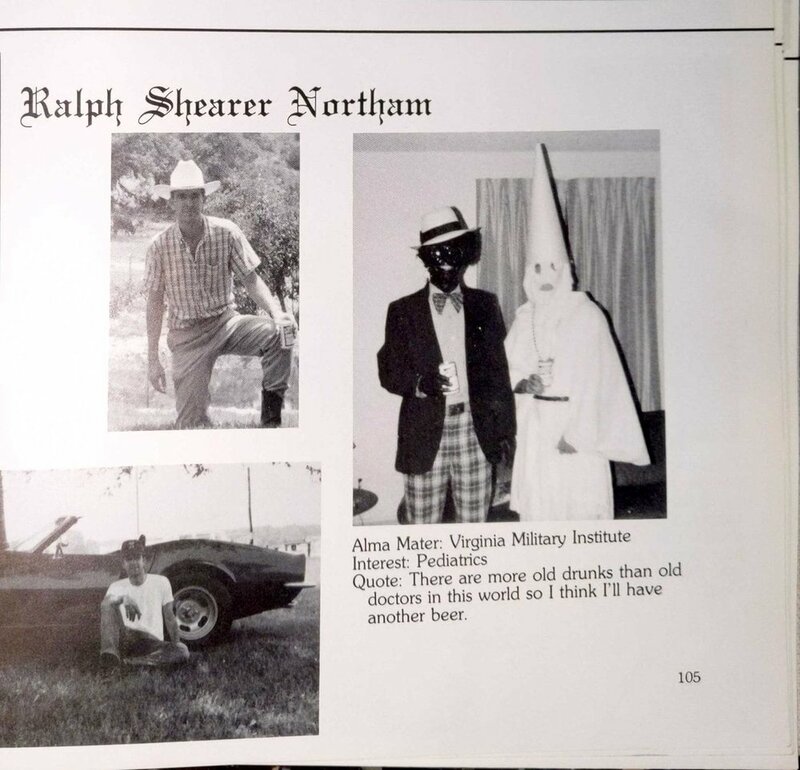 Ralph “Sheets” Northam didn’t bother to tell us whether he’s the moron in blackface or the one wearing the sheets. Until he does, this is a case of Schrodinger’s Klansman. He’s both. The shocking photo was first posted on Friday by the website Big League Politics. Within hours it was leading The Drudge Report and all cable news stations. It’s been a terrible - likely career-ending - week for Ralph Northam who stupidly gave a radio interview on Wednesday in which he coolly defended what normal people would label infanticide. Now we see his yearbook page from Eastern Virginia Medical School with the sickening racist image. This was from 1984, by the way. Long past the time when blackface was considered amusing in certain Democratic circles. And Ralph Northam was 25. Not a teenager. Oh, and this was just six years before Virginians elected Doug Wilder the commonwealth’s first black governor. Remember how the left lost their minds over Supreme Court Justice Brett Kavanaugh’s cryptic teenaged references to girls and drinking in his high school yearbook? Seems pretty tame by comparison, doesn’t it? Ralph Northam is in deep trouble. If he survives as governor he’ll drag down fellow Democrats in November when they attempt to wrest control of both houses of the General Assembly. That hideous picture will be in every campaign commercial. Even if he resigns, deep damage is done. Turns out the party that campaigned against Confederate monuments and accused mainstream Republican Ed Gillespie of being racist nominated their own medical school racist to lead the party. It’s not the first time Ralph Northam’s been accused of racism. I wrote a Virginian-Pilot newspaper column about Northam dropping his black running mate from campaign literature in 2017. His excuse was nonsensical. Feb 1 Ralph Northam Campaign Flyers Omitted His Black Running Mate. Was It Racism Or Politics At Play?